My first race since God knows when. Nerves are high. Rain is falling as my Mom and I drive on 64 to get downtown. I’m telling her “I can’t run in this rain.” She didn’t reply and it was like a non verbal way of saying “Why not?” We get downtown and park so I can pick up my bib. I have no idea of the process and what to expect. I see people doing sprints, jumping up and down in one place and stretching. I’m thinking I need to do the same thing. 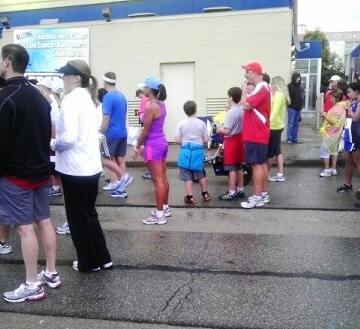 The rain finally lets up as we line up to start. The route was down main street, across the 2nd street bridge and back. I always wanted to walk across that bridge and now was my chance to run. I made sure I took in the scenery which isn’t too much looking towards the Indiana side. The clouds cleared and the sun was beaming down. I crossed the bridge and was expecting an immediate turn around to signal the half way point. I became aggravated as the route went way past the end of the bridge and down a couple blocks. I make the turn around and it was smooth sailing. There were some volunteers handing out water on the bridge and one lady refered to my purple outfit as she cheered me on. She put a smile on my face. I near the finish line and I’m looking for my Mother. I guess I didn’t explain myself well enough because she was on another block. I’m looking around and finally I see her. I enjoyed the Panera bread and water that the sponsors provided. I had to turn in the timing chip that was on my shoelace. Again, this is all new to me. After waiting around the results were finally in. 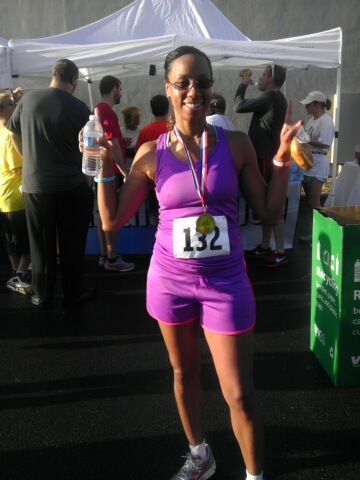 My first 5k age group award for 1st place. Yay! This is my introduction to 5ks. Rest in Peace to my Grandpa, Boyd Smoot. Next time I get tired while running, I will act like Big Foot is coming to get me!!! This entry was posted in running, Uncategorized and tagged 5k, Familes for Fathers, Prostate Cancer Awareness, Running. Bookmark the permalink. Thank you for taking time out of your busy schedule of being a wife, mother of 5, and sustaining a career to expose me to sports at an early age. It will come full circle when we can do our first 5k together. Love you more! So proud of your ability to finish what you start. Life lessons are learned with every race and carry over to how you live your daily life. Love you my girl!